This talented young man is graduating! Vince is much like James in the way that they are both a little shy until you get to know them. Most guys hate getting their picture taken but you’re only a senior once!! We taught him some posing and his “model look” was on point every time. He did an amazing job! It was difficult picking out my favorites from his session. 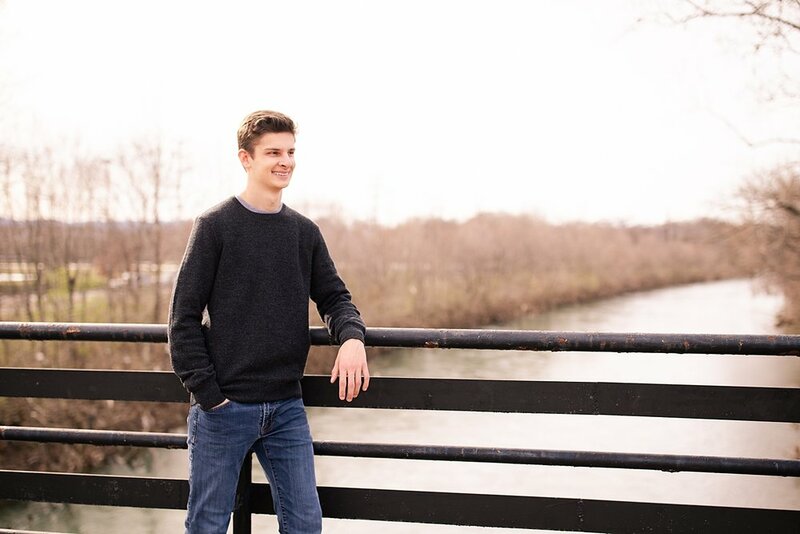 The first part of the senior session we started out at River’s Edge Sports Complex Park in Roanoke, Virginia. The weather was absolutely beautiful which made our session a bit of a challenge because there were so many people biking, running, and walking in the park! We had to dodge all the people for shots but I’m so glad we went there! It was a beautiful spot for the Ferro’s family and Vince’s senior portraits. For part of his session he wanted to incorporate his favorite sport: Soccer. So I chose River’s Edge Sports Complex Park because I thought there would be soccer goals near by for those shots! Well of course the soccer fields would be under construction when we are there. Fail! It’s alright though because his dad is a soccer coach for Roanoke Valley Christian Schools! He was able to get us on the school’s field for the rest of the photos. Despite the muddy field we got creative with some soccer photos with both Vincent and his sister Kate. We even recreated an old photo of these two as little kids! I think their momma was happy!! James and I are so excited for the 2019 graduating class of Roanoke Valley Christian Schools!! We love the opportunity to photograph seniors from our alma mater. It reminds us of the good ole days and just how old we really are!! We we are going to share some of last seasons soccer photos that will feature Vincent as well! Keep a look out for that post this summer! Enjoy my favorites of this Roanoke senior session.